The Light between Oceans is unquestionably a tear-jerker. As the film draws to its bittersweet conclusion, dry eyes will be few and far between. But, as manipulative as it is, the narrative also poses its share of intriguing philosophical questions. When is a “kidnapping” not a kidnapping? To what extent should leniency be shown to possible criminals when a child’s well-being is at stake? And, perhaps most forcefully, what constitutes being a parent? The movie doesn’t have answers to these questions, where right and wrong float in a sea of gray. This story is about love and the price it extracts from us to succumb to its grip. It’s also about guilt, forgiveness, and redemption. In some instances, such as the scenario presented in The Light between Oceans, those things are entwined. Characters make catastrophically bad decisions because of love - love for a partner, love for a child. They must then cope with the ramifications of those decisions. The film features no villains, only flawed people who are in opposition because of the quirks of fate and choices that, although ill-advised, are understandable. Can any of us say that, when placed in the position of these characters, we would act differently? The nobler part our natures might argue that we would but the human part might say otherwise. 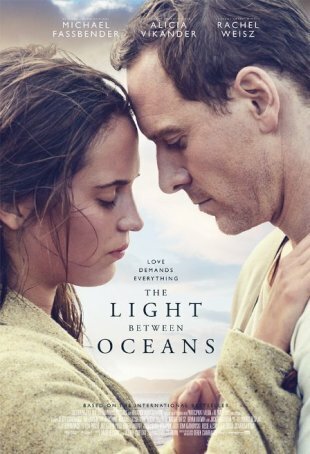 The Light between Oceans introduces us to a reserved World War I trench battle veteran, Tom Sherbourne (Michael Fassbender), who opts to take a job as a lighthouse keeper on a remote island off the western coast of Australia. During his brief stints on the mainland, he meets and falls in love with a local woman, Isabel (Alicia Vikander), who agrees to be his wife. She comes to live with him at the lighthouse and they create their own little world on the island, set apart from the rest of humanity except when the supply ship comes. Attempts to have children are not successful, however. Isabel becomes pregnant twice and, on both occasions, loses the child. Then, like a gift from God, they are given a chance to be parents. One day, shortly after the death of their second unborn baby, Tom spots a rowboat being buffeted by the seas just off the coast. He swims out, corrals it, and brings it to shore. Inside are a dead man and a living infant. Tom’s first instinct is to report the incident but Isabel convinces him to instead pretend that the baby is theirs. Overcoming a bout of remorse at falsifying his records, Tom accedes to his wife’s request. For a while, they are a happy family of three but, during a visit to the mainland, Tom discovers that the lost-at-sea baby was presumed dead and is being mourned by her mother (Rachel Weisz). Unable to cope with his role in the woman’s sadness, he makes a rash decision that threatens not only his marriage but potentially his life. Strong acting goes a long way toward making The Light between Oceans more than a period-piece soap opera. Contrivances and melodrama aside, it is emotionally true and that’s often the most important thing for a film of this nature. Fassbender is excellent as the remote Tom, whose war experiences have wreaked havoc on his psyche. Alicia Vikander’s Isabel is his exact opposite - open and expressive in ways that are often extreme. The first third of the film, which concentrates primarily on the relationship between these two, evidences a powerful chemistry between them (they became a real-life couple during this production). Later, as the narrative becomes more complex, both actors are forced to undergo radical and believable changes. Although the second half of The Light between Oceans is more emotionally wrenching and philosophically rich than the first half, I was partial to the early scenes. There’s something powerful and evocative about the idea of a man being willingly marooned on an island to care for a lighthouse. The sequences with Tom alone and later with him and Isabel in their companionable isolation are hypnotic. The stark simplicity of their lives is effectively conveyed by director Derek Cianfrance. The lighthouse is simultaneously forbidding and comforting. The island is desolate but at the same time it’s home. During the course of the film, each of the characters faces a moment when he/she must make a choice. These are difficult decisions and the inherent sacrifice of each is presented through both the acting and the writing. The epilogue, although bringing closure to the entire story by peering decades into the future, offers what may be the saddest moment of the tale. Nevertheless, although The Light between Oceans doesn’t shy from tragedy and misery, there’s something life-affirming at its core. It’s a well-made, serious drama arriving in an era when those qualities rarely describe multiplex fare.